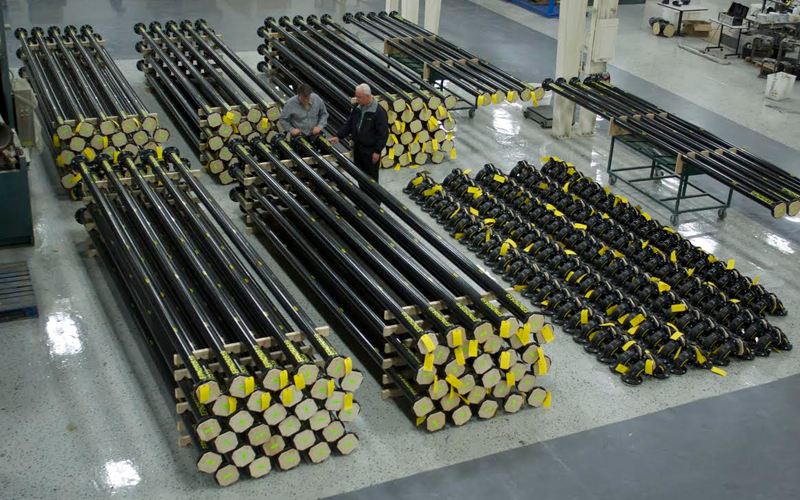 Durcor® 50’s are the longest lined pipe ever manufactured by any company, another first for the PureFlex Durcor piping system. 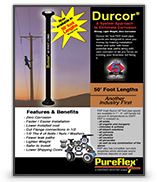 Durcor 50’s offer fewer flange connections for faster installations and fewer potential leak paths. We are pleased to announce that we have acquired Macken Industries. Macken Industries is a metal expansion joint manufacturing company located in North Arlington, New Jersey. The new company will be a "Bolt-On" product for PureFlex Inc. and sold as PureFlex bellows / metal expansion joints. The acquisition will allow us to be more self-reliant and provide improved service, quality and delivery times while expanding our product catalog. 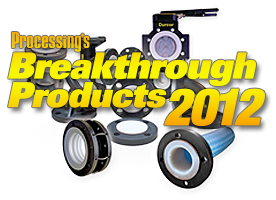 PureFlex® Inc. awarded Breakthrough Product of the Year by Processing Magazine. ANDRONACO INDUSTRIES today announced its business unit PureFlex, Inc. has been awarded "The Breakthrough Product of the Year" by Processing Magazine for its advanced structural composite piping system, Durcor®. The Award recognizes products, technologies and services that made significant contributions in the process industries within the last year, and are expected to impact the industry for years to come. In picking products for the award, judges examine their significance and uniqueness in the process industries, along with associated innovative technologies and range of application. The award is widely regarded as one of the most prestigious given in the process industries. PureFlex is breathing new life into a vacant building on 44th Street. PureFlex, an Andronaco Industries company founded in 1994, will expand a new line of production into the former MacDonald's Industrial Products site at 4242 44th St. Nil-Cor, another Andronaco Industry company, also will occupy part of the building. Renovations have started and should be completed in the first quarter of 2012, according to Ron Andronaco, founder of PureFlex and Andronaco Industries. He expects to hire an additional 12 to 20 employees. PureFlex specializes in the manufacturing of fluid handling and sealing products. "The building has good bones. The structure itself is sound," said Andronaco. But the interior is in poor shape, and Andronaco estimates it will be a nearly $1.9 million investment to rehabilitate the facility and site. "There is a tremendous amount of work that has to go into this facility. The pits are filled with water, all the plumbing has been smashed and destroyed. Wires have been stripped. It's a disaster inside," said Andronaco. The nearly 100,000-square-foot facility has been vacant since 2006. It was built in many phases, starting in 1967 with the last addition in 1997, according to Deborah Ring, city assessor. In late 2007, the property was listed for sale at $2.5 million. Since then, Ring reported the value of the property has dropped nearly 73 percent because of its obsolescence and physical deterioration from vandalism. The property’s true cash value, Ring said, is $629,400. There also is environmental contamination caused by the former metal plating use on the site. Andronaco requested a 12-year rehabilitation certificate to help bring the building back to usable condition. City commissioners granted eight years. That means the assessed value of the building will be frozen at the current level of $629,400 for eight years, even though at least $1.9 million in improvements will be made. "I'm a huge believer in renovating instead of building new. My company is 17 years old. We started with three people and 1,200 square feet. Today we have 150 people and more than 400,000 square feet of manufacturing space," said Andronaco. PureFlex has facilities at 4617 East Paris Ave., and Andronaco Industry headquarters are at 4855 Broadmoor Ave.
Andronaco Industries is the parent company for seven manufacturing companies including PureFlex, Nil-Cor, Ethylene, Hills-McCanna, Ram Parts Pumps, Poly Valve USA and Andronaco SAS in France. Combined, Andronaco Industries employs about 150 people. (www.pureflex.com), has launched its new, redesigned and improved website today. The new website, which is designed with the customer in mind, features, smaller downloadable product brochures for all PureFlex products, an easier to use Material Test Report lookup form, along with our unparalleled Chemical Resistance Guide and much more. PureFlex, INC is proud to announce that it is now certified to the ISO 9001:2008 Quality Management Systems standards and guidelines. PureFlex, INC has achieved its ISO 9001:2008 accreditation from Smithers Quality Assessments (SQA). ISO 9001 is accepted worldwide as the inclusive international standard that defines quality. The registration of compliance with ISO 9001:2008 recognizes that the policies, practices and procedures of our organization ensure consistent quality in the services and manufactured product we provide our customers. With this registration, our customers can be confident that PureFlex, INC is dedicated to maintaining the highest effectiveness and responsiveness in achieving our goal of total customer satisfaction. TASK-LINE - The greener choice. Every bit of scrap produced in the manufacturing process of TASK-LINE and Riload bearing pads is recycled and renewable. Scrap PTFE is used in ink for ink pens and scrap steel is sent to a recycle mill to be turned back into productive product for industry use. Reduce your ecological footprint with TASK-LINE and Riload bearing pads. 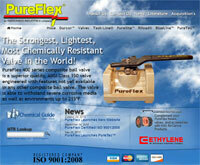 (www.pureflex.com), has launched its new, redesigned and improved website today. The new website, which is designed with the customer in mind, features smaller downloadable product brochures for all PureFlex products and an easier to use Material Test Report lookup form, along with our unparalleled Chemical Resistance Guide and much more. PureFlex adds another new Mazak. Pictured is the new Mazak DualTurn being unloaded off a semi. Mazak DualTurn CNC machines have dual chucks and can transfer parts from one chuck to the other on the fly for rapid secondary machining operations. The machine is also fitted with a gantry robot for PureFlex 3rd un-manned shift operation. The lights go out and the machines keep manufacturing hose fittings for 6-8 hours. Replacement cost of the new machine is over $250,000. The continued investment in state of the art technology confirms PureFlex leadership roll and commitment to its customers for high quality hose & hose fitting products at Lower costs, delivered fast. New 18" Butterfly valve PureFlex has completed its new 18" size, advanced composite, PTFE / PFA 800 series butterfly valve. The valve body utilized our proprietary Durcor-62 material that is as strong as steel, ½ the weight of ductile iron valves and offers zero corrosion rate in hostile environments. PureFlex releases the largest PTFE convoluted hose in the USA PureFlex new 6” diameter UltraFlex™ hose is manufactured from PTFE resin to provide the ultimate in chemical resistance, purity, flexibility, longevity and value. The Hose is available with Polypro or 316 stainless braid and PureFlex flare-through flange fitting design. PureFlex also offers its Durcor-62™ composite flanges that have the strength of steel while reducing hose fitting weight by 1/3. 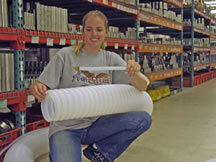 PureFlex is the world leader in PTFE hose and fitting technology. 2004 growth continues at an astounding pace. "The results for 2004 are outstanding" Mr. Andronaco said. "We had an incredible year with a 46% increase in sales". "There is no doubt that PureFlex is the leader and continues to be the fastest growing and profitable company in our industry". "Our product range combined with our excellent service which is focused on our customers is key to our success". “Our investments in state of the art technology provide us the edge in servicing our customers with the best products at the lowest prices delivered fast". PureFlex adds (2) new Mazak CNC lathes and (1) CNC mill to its growing fleet. 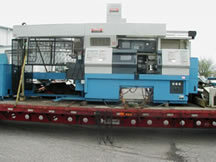 Pictured is one of two Mazak DualTurn 20's being unloaded off a semi. Both Dual Turn 20's have dual chucks and can transfer parts on the fly for secondary machining operations. The machines are also fitted with gantry robots for PureFlex 3 rd shift un-manned operation. The new machines brings PureFlex fleet of CNC machines to (13) with (5) being twin spindle and (4) being robot loading. Replacement cost of the (3) new machines is over $600,000. The continued investment in state of the art technology confirms PureFlex leadership roll and commitment to its customers for high quality products at Lower costs, delivered fast. PureFlex manufactures more of its own product in its 65,000 sq. foot manufacturing plant then any company in the industry. 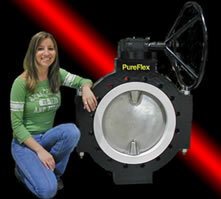 PureFlex is the leader in Ultra-Pure and chemical resistant valves, hoses and fittings.